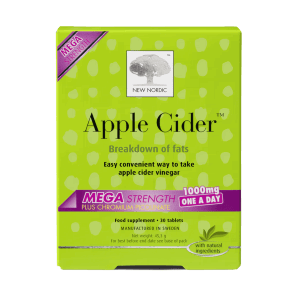 Facts about the natural ingredients: Highly concentrated bio-available apple cider vinegar tablets combined with artichoke extract, which may help maintain a healthy digestion, and dandelion extract, which may help maintain a normal body fluid balance. 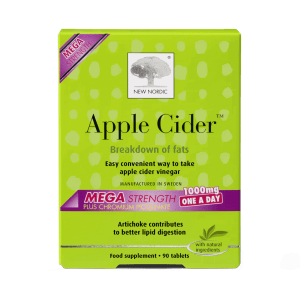 Provides 720 mg highly concentrated apple cider vinegar per tablet fortified with standardised globe artichoke and dandelion. Take 1 tablet with a glass of water at breakfast. Food supplements are intended to supplement the diet, and should not be a substitute for a varied diet or healthy lifestyle. Do not exceed the stated dose. Caution: Seek professional advice before using if you are pregnant, breastfeeding or suffer from allergies. Warnings: Not suitable for children under 12 years of age. Do not use if blister package (inner foil) is broken or tampered with. Keep out of reach of children. 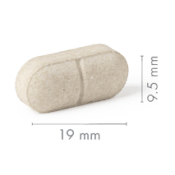 The apple extract used in this tablet is naturally rich in the herbal substance procyanidin B-2. Chosen apples are picked, dried and extracted, so that the desired herbal substances area preserved. It gives a guarantee for a high standardised quality. Dandelion is 10-30cm high and rooted deep in the earth by a strong taproot. Dandelion is rich in in vitamin A, and a good source of vitamin C.
The artichoke is an upright thistle like perennial with a strong grooved stem and big leaves. The artichoke plant is a perennial, which has been known in the Mediterranean countries for more than 2000 years. The dried leaves from the plant is used for this tablet. Apple Cider™ Mega is gluten free. Apple Cider™ Mega is dairy free. Apple Cider™ Megadoesn’t contain products derived from animals. Take 1 tablet with a glass of water at breakfast. Food supplements are intended to supplement the diet, and should not be a substitute for a varied diet or healthy lifestyle. Do not exceed the stated dose. Caution: Seek professional advice before using if you are pregnant, breastfeeding or suffer from allergies. Warnings: Not suitable for children under 12 years of age. Do not use if blister packaging (inner foil) is broken or tampered with. Keep out of reach of children. Apple cider vinegar powder, filling agent (microcrystalline cellulose), Cynara scolymus L. (globe artichoke), Taraxacum officinalis Web. (dandelion), coating agents (magnesiumstearate, hydroxypropylmethyl cellulose), disintegrator (crosslinked sodiumcarboxymethyl cellulose), anticaking agent (silicon dioxide), mineral (chrome picolinate).